Therefore all items being sold as gold, silver, platinum or palladium in the UK must be hallmarked to confirm that they meet the legal standard. This cannot be done by the manufacturer or importer; goods must be submitted to one of the four UK Assay Offices, or an Assay Office belonging to the International Convention. • ASSAYING to determine whether the precious metal content of the alloy meets the required standard. To find out more click here. 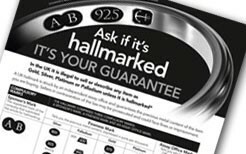 • HALLMARKING to apply the appropriate mark to the article. To find out more click here.